Downlights are a great alternative to pendant light fittings and when fitted correctly they make a great feature to any room. Downlights are a great alternative to pendant light fittings, when fitted correctly they make a great feature to any room. You can fit them in your kitchen, lounge, dining room or bathrooms, when fitting them in wet rooms its advised to use fittings that are IP rated to IP65 as they protect against water ingress. They come in many different colours and sizes, lamp types are halogen or LED. 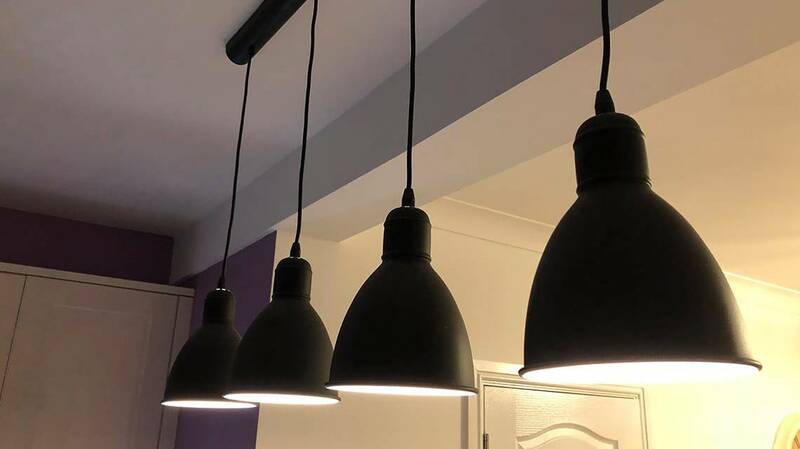 LED (light-emitting diode) are a little more expensive than a halogen but you will save on electricity with LED so, in the long run, you will save money. The standard size is around 75mm in diameter but can range from 10mm to 300mm and the 4 main colours are brushed chrome, polished chrome, white and gold. There are 3 main lamp colours and they are cool white, warm white and daylight. On the colour temperature chart for cool white is (2700K – 3000K), warm white (3500K – 4100K), and daylight (5000K – 6500K). When installing downlights you should opt for the fire rated type. Fire rated downlights are designed to prevent and minimise fire from spreading, when installed they are recessed in the ceiling. To recess the fitting you have to cut a hole out in the plasterboard so the ceiling then loses its integrity so to restore the integrity it is better to install fire rated downlights as they are designed to deter fire for longer periods. All our downlights that we install are fire rated as standard.